In 2010 I again made some calendars for family and friends - for Christmas presents. After a few disasters (days of the week not fitting with dates, November getting 31 days instead of 30) I got it right. One featured the garden. 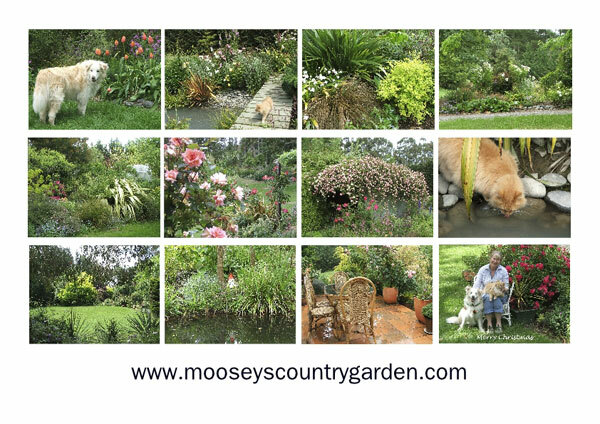 I also chose a collection of cat photographs to make a Cats Calendar especially for Daughter of Moosey. She was based overseas, and loved having different animals from home on her wall each month. 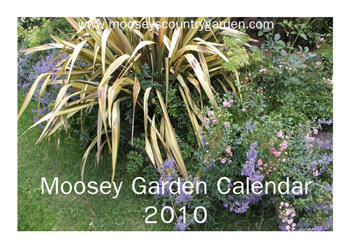 My 2010 Moosey Calendars were in a PDF format, available to be downloaded and printed for no charge. I had such fun making them! But they had full page landscape images (to use up all the printer ink, oops) and at the time were pretty big files for some folk to download. Plenty of time to make a cup of coffee and pull out a few weeds if you didn't have broadband! Ouch! Adobe Acrobat Reader is required to view PDF files. This is a free program available from the Adobe Web Site. Follow the download directions on the Adobe web site to get your copy of Adobe Acrobat Reader. And check the printing options for PDF files - for example, you can print two pages on one sheet of paper. Could be useful!